Most other laws of physics do not prevent rolling billiard balls from assembling into a pyramid, infused tea from flowing back into the tea bag, or a volcano from "erupting" in reverse. But these phenomena are not observed, because they would require an isolated system to assume a more ordered state without any outside intervention, which runs contrary to the second law. The nature of that law has not been explained in full detail, but researchers have made great headway in understanding the basic principles behind it. "Suppose the electron is localized when we begin observing it. This means that we're pretty sure about its position in space. The laws of quantum mechanics prevent us from knowing it with absolute precision, but we can outline a small region where the electron is localized," says study co-author Andrey Lebedev from MIPT and ETH Zurich. "However, Schrödinger's equation is reversible," adds Valerii Vinokur, a co-author of the paper, from the Argonne National Laboratory, U.S. "Mathematically, it means that under a certain transformation called complex conjugation, the equation will describe a 'smeared' electron localizing back into a small region of space over the same time period." Although this phenomenon is not observed in nature, it could theoretically happen due to a random fluctuation in the cosmic microwave background permeating the universe. The team set out to calculate the probability to observe an electron "smeared out" over a fraction of a second spontaneously localizing into its recent past. It turned out that even across the entire lifetime of the universe—13.7 billion years—observing 10 billion freshly localized electrons every second, the reverse evolution of the particle's state would only happen once. And even then, the electron would travel no more than a mere one ten-billionth of a second into the past. Interestingly, the time reversal algorithm itself could prove useful for making quantum computers more precise. "Our algorithm could be updated and used to test programs written for quantum computers and eliminate noise and errors," Lebedev explained. Researchers . . . returned the state of a quantum computer a fraction of a second into the past. A special program modifies the state of the quantum computer in such a way that it would then evolve "backwards," from chaos toward order. Sounds more like a clever reset than time travel into the past. If running a program to put things back the way they were is time travel, then so is cleaning my room. I think it is irresponsible and dishonest to describe the execution of this program as 'reversing time.' And scientists wonder why we don't take their word seriously? It is much more easily and naturally explained with a normal forward time flow. In addition a 50% success rate for 3 qubits is a miserable failure. 50% on a test is a miserable F in my teacher's grade book. I sincerely doubt whether quantum computers will ever amount to anything, especially since it seems to depend on an invalid understanding of quantum mechanics, the Copenhagen Interpretation. And scientists wonder why we don't take their word seriously? Homebrook, you are a Scumbag Denier working the, "more CO2 is a good thing" angle, so your motives for commenting are untrustworthy. For example, in this case, one exaggerated claim, from Russia et al. no less, and you conclude all scientists have no credibility. The paper is open access as given in the DOI link in the article above. This looks like the work of another first-year journalism student to me, complete with hyperbolic title. I seriously question whether this has anything to do with "physicists reversing time." I also note that the Fluctuation Theorem was mentioned in the paper, but not in the article. I'm no physicist, but wouldn't it be more accurate to describe this experiment as reversing 'entropy' and not 'time'? A similar article was posted in the magazine Scientific American over 55 years ago. There is no reason to believe that a "quantum computer" has any more relevance than whimsy. Computers in any configuration, including A.I., are simply reactive thus will never be able to foretell the future or the past. Glorified Tarot card readers have exactly the same accuracy as programmers, zero ! These idiots are NOT scientists! We have some passionate commenters working on this article. The piercing indignation of their burning skepticism is sure to dispel any demons hanging around to cause trouble in science, either now or in the very recent past. Speaking of whimsy, just to annoy the mousie. How about a speculation about the math of the billiard balls resulting in the observer's inability to tell if there is any difference between the balls traveling forward or backwards in time? With me following speculation that the billiard balls did not travel anywhere. But rather that the billiard table did the time traveling? Which leads to the fabulist conclusion for an observation that whatever direction of Time we are traveling In? The Universe ignores our efforts & carries all Reality in any damn direction of Time, the Universe is damned well intent upon. *sigh* Here we go again; inept 'science writers' and hack 'paper writers' misrepresenting reality for the sake of (unearned) wages/citations/grants etc from equally disingenuous 'peers'. The stupid analogy of "playing back a film of colliding billiard balls" IGNORE the crucial fact that the FILM is NOT the actual material being filmed! It's merely remote information via photonic recordings that can be 'played back' but NOT actually 'reversing' the objects in reality. The ACTUAL MATERIAL OBJECTS are NO LONGER where they were when filmed! So it's dishonest to equate 'playback' with 'time-reversal'. Sure, actions can be reversed, but that only 'redirects' on-going action within the same ENERGY-space, not some abstracted 'TIME'-space. No wonder such silly 'publish-or-perish' studies/papers give scientists/science a bad rep for living in a patently self-serving 'peer group' fantasy world of their own. Stop this! Start punishing these hacks! well rc, since you insist on bringing up the subject? You seem quite addicted to these "stupid analogy" you are always whining about. Since you do not approve of any research results that do not match your delusions of pompous pedagogy? What masochistic fixation keeps pulling you back in to disappoint yourself all over again? rc, you are like a dog, licking up it's own vomit just to spew it up again & again! well rc, since you insist on bringing up the subject? You seem quite addicted to these "stupid analogy" you are always whining about. Since you do not approve of any research results that do not match your delusions of pompous pedagogy? What masochistic fixation keeps pulling you back in to disappoint yourself all over again? rc, you are like a dog, licking up it's own vomit just to spew it up again & again! This is silly. The electron cannot reverse and go back into the past - just as a human cannot go back to yesterday from today since the Earth's rotation has caused the Sun to rise on a new day - and is not about to make the Earth's rotation reverse course. Time is STILL in the mind/thought of the one who is thinking about the duration of an Event. Time is only the name given to the duration and its increments as provided by a timepiece - or in the observation of Mass in motion/momentum. And a computer cannot reverse time - whether Quantum or otherwise. Reversal of time, if it were possible, even for 1 second, would complicate reality without end. Many things could occur within that 1 second that could be detrimental to reality. What would happen to that 1 second? Yes, same here. I thought of the same idea as I read it. Everyone knows that there are reversals in entropy (on very local scale endothermic reactions etc.) but I can't say that a reversal of time had been achieved. Ha, I'm waiting for all those headlines to appear in local 'online rags' and extrapolations thereof...from aliens, ghosts and 'in the future unbreak your eggs will be possible'...Ha! What is referred to as "time" lives ONLY in the human brain. No, what lives in the human mind is not time, but entropy. We often confuse them because we see increase in entropy as "passage of time," but that is not what time is. The pool rack being split in the break is not the arrow of time. It's merely the second order results of matter moving in time. The FT shows that. Perhaps Dark Matter is just "smeared" across time, and we should be looking for it yesterday. Macroscopic systems typically have a very large number Ω of possible microscopic configurations. For example, the entropy of an ideal gas is proportional to the number of gas molecules N. Roughly twenty liters of gas at room temperature and atmospheric pressure has N ≈ 6×1023 (Avogadro's number). At equilibrium, each of the Ω ≈ eN configurations can be regarded as random and equally likely. - Time is only a product of the Mind/Brain and has nothing or very little to do with Entropy. And how do you propose to get back to yesterday to look for DM? It's started. 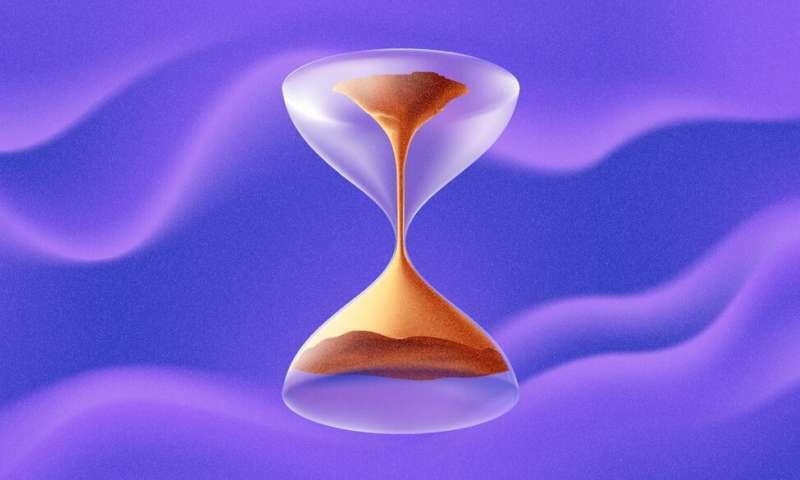 Saw a headline on MSN (via a newspaper) quote; Scientists have reversed the direction of time with a quantum computer; unquote. Ha! Time is not substantial, and is merely a metrical representation of the evolution of the current state of the universe, originating with quantum charge interactions. It utilizes arbitrary orbital and rotational reference systems, most originating in natural processes. What is that supposed to even mean? Useless words. Kinda hard to deny the existence of time given the 2LOT. ... 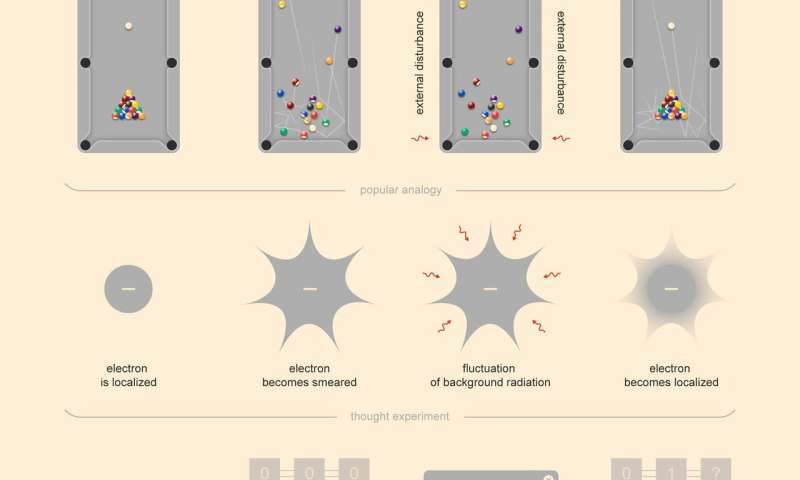 There is no reason to believe that a "quantum computer" has any more relevance than whimsy. Computers in any configuration, including A.I., are simply reactive thus will never be able to foretell the future or the past. Glorified Tarot card readers have exactly the same accuracy as programmers, zero ! Unlike you, I am speaking as a real AI expert here. Everything you said in the above is false. Please don't make ignorant crap up. If one considers time and gravity to be secondary, not primary, (effect not cause) then it may be a bit imprecise.... but probably not all that inaccurate. Just wonder how many physicists actually play billiards! Using real world (Newtonian type physics) objects to describe an analogy to quantum effects is always going to be fraught with failure and confusion. The sensationalist title 'reverse time' works in grabbing our attention. However its very misleading especially given that we don't really know what time is or if it actually exists - Just a human observation of something else? The one thing for sure is that this is not a 'reversal of time' in any human meaning of the phrase. @Mark Thomas, Nice ad-hominem attack! Very persuasive, I am sure, and fair-minded too. But what about the substance of my comment, that the article greatly exaggerated the significance of their findings. Originated from Russia, true, but published in Scientific Reports, a supposedly reputable peer-reviewed journal, and you read it here. Why publish such silly exaggerations!? Does it help? The endless over-hyped, sensationalized 'science' stories weary me. And many readers are undiscerning enough to actually conclude that time was reversed and entropy violated because of reading an article like this one. Perhaps you as well. You seem the credulous sort. And I don't summarily dismiss scientific findings that originate from Russia, as you do. I let them stand on their own merits. Truth can come from any quarter, but these scientists did not reverse time; they did not reverse entropy, despite the headlines to the contrary. This can be a useful reset technology for quantum computers, but time reversal it isn't. In a very-much forward-time manner the researchers appear to be setting up a boundary condition in analogy with the external compressive pressure in their thought experiment on the free space electron spread--which would involve global entropy increase greater than or equal to zero per the second law of thermodynamics. Loosely speaking, "refrigeration" is not time reversal--though maybe there is something to say on that. Perhaps we should not be talking of forward and reverse time globally but rather as a variable mapped on to spacetime, and a global averaging in pixelating larger and larger regions on that map in panning out. However, at some large enough pan level (certainly in our epoch), those pixels better all prove forward-time in direction. I assume that is what is referred to when the article notes that the "nature of that law has not been explained in full detail", because the likelihood discussion on states in the article is the deeper statistical physics explanation. Mind that relativity guarantees that 1) time order observation is relative, physics law observation is absolute [https://en.wikipe...ltaneity ; see the 3d gif] and 2) no signal can travel back in time or faster than light (causality). AFAIK there are quantum experiments that arguably revert entanglement and decoherence, as well as the time order "time travel" reversion that relativity allow (though googling them would be a chore). Since "primary/secondary" is as ill defined in causality physics as naive/philosophical cause/effect, this seems to be more useless words. Time and gravity are observed. Don't mind these crackpots, when they don't like model predictions they are usually of the US political anti-climate science bent (and IIRC there is an Anonymous### here that fits the bill). C.f. conspiracy theory and Dunning-Kruger. The way to find the truth is to understand and conduct the experiment. We need to find a difference between opinion and reality in a well conducted test. By testing and observation you might find a detail missed in a popular theory. In the case of well tested theory you find that they are true to the limits of their instruments. If they are right, they will pass by the negative response and use their new found knowledge. It is intresting that the cycling states in a quantum system resembles a time crystal. One might imagine that time in such an experiment is isolated from our own time except for the point of interaction. The direction and state of time would not violate the physical laws of our own time because of the qbits non locality. It is like the quantum system is in a state like entanglement over kilometers. It is not like the components of a slide rule. The components of the computer could be replaced with any quantum object like single particles or a condensate. @torbjorn, the FT says the 2LOT applies less and less as the volume under consideration and the time for it to evolve becomes smaller. I think this theorem is insufficiently understood. It is very firmly based and very strong supporting evidence for it has been produced in the lab, more than a decade ago. It's even referred to in the paper we're discussing here, though only in passing. Before all is said and done, I expect the FT will turn out to be one of the most important links between classical and quantum behavior. Consider this carefully: the FT says entropy increase and decrease are equal at the quantum level, and that entropy increase is dominant at the classical level. This is an astonishing statement, considering our understanding of classical entropy and of quantum mechanics. Consider that all quantum mechanics must reproduce classical mechanics and the disconnect becomes clear. There's still something we don't yet quite get. There is no "the experiment." There are thousands of experiments done every day. Each one's results are noted, analyzed, compared with theoretical predictions, and published. And time is not something that has a direction or state. Matter has a direction and state in time, just as it has a direction and state in space. Extraneous apostrophe. Lern to Inglish. It means that what is referred to as "time" has no substance that can be quantified as a "thing". Space, OTOH is a "thing" that can be reckoned with in many ways, such as moving through it. It is impossible to "move" THROUGH time, as it has no properties that could be moved through. It is a NOTHING and it only exists in the MIND/BRAIN of the person/entity who has thought of it and named it. All Actions/Events are "things" that MOVE through and within SPACE, and the observation of those Actions/Events and their DURATION. While time is nothing that moves and cannot move at all except by a MIND/BRAIN observing the hands or numbers on a clock face that shows the incremental movements of the hands/numbers. I find it amazing and laughable how humans cling to such preconceived notions - and that is all that time is - a notion. Works fine in SRT, @SRU. Just another troll. Can't do math, can't do physics, doesn't even understand that time symmetry is the complement under Nother's Theorem of conservation of energy. Time and gravity are observed. That is only half-correct. Gravity and its effects on Mass are observable. But the concept of "time" is unobservable, which is why clocks/timepieces were invented and the concepts of hours, minutes and seconds were incorporated into the mechanisms of those instruments. The concepts are formed in the human mind/brain through observations of the Duration of Events/Actions/Happenings and their Effects on those Events/Actions, etc. I have been asking this for many days, and still haven't gotten a proper answer. Still trolling me, Da S? Theorems combining time will obviously be left for the new theorists that come along to remediate the errors of those early theorists. The dead are better off left alone, and hopefully, the living will find out soon enough that they had been led astray by Minkowski's Spacetime silly nonsense, for which Einstein got the blame. Why this obsession with chaos? I've always held to the idea that an isolated system evolves into a state of harmony. The cube of ice in its place melts to the ambient temperature of its environment. Homogeneity is not chaos. ..the region of space containing the electron will spread out very quickly. That is, the system tends to become more chaotic. All I see happening is that the event is being scaled differently. The "chaos" lies in the inability of the observer to comprehend what is going on. This "disorder" paradigm violates the Heisenberg principle, by referencing a slice in time wherein all parameters can be observed and confirmed, when in fact, there is only a continuum of order, as can be proved be isolating that slice of time with no reference to tense. These guys should work on a practical application of their "work", the re-integration of disintegrating particles. That's true. It cannot be any other way. 54 hours ago, as the crow flies backward and the clock hourly hand turns counter-clockwise, the Earth and the Sun and all other Matter in the Universe would have to magically run backward to where it was 54 hours ago. That means that cars wouldn't have to have their gearshift in reverse to go backward. If you don't know the relation between the symmetry of physics over time and the conservation of energy, you aren't even worth reading. Symmetry of physics over time is, if I do this experiment today, or I do it tomorrow, I get the same result. Now explain why that's related to conservation of energy. This could be quite useful. Taking it to the next level in combination with E8 quasi crystal math approaches. LOL Excellent suggestion. Perhaps they could even eliminate the radioactive waters at Fukushima by reversing the Events that led to the tsunami destroying the nuclear power plant. There are a number of things that I can think of that would be of benefit to the world and humanity if the concept of time could actually be reversed. First, tell us, WHAT IS TIME MADE OF? The same thing as space. NMR nuclear spin Magnetis Resonance echoes, quite old since 1948, are exactly similar reversing back after reversal of their position, focusing again as if it was time reversal, when it is simply reversing their posiiton of evolution in a time that is never reversed !! It is very useful in Magnetic Resonance Imaging on ill patients. Incidentally, space also is a symmetry of physics that has a corresponding conservation law under Noether's theorem. The complement to symmetry over space is conservation of momentum. You can't, of course, any more than you can explain why conservation of energy is related to symmetry over time. Symmetry over space means if I do this experiment over here, or I do it over there, I get the same result. Same as if I do it today, or tomorrow: same result. This is basic reality, the most basic we know of. And against this you have the Babble by the drunken stone age sheep herders about the super magic daddy in the sky, which you claim isn't fantasy. This is what you think is better than science. Answer the question. WHAT IS TIME MADE OF? @Da Schneib '....There's still something we don't yet quite get.' and other comments. Yes I do tend to agree with you in as much as a layperson could. In a simplistic way (I admit the danger in doing this) I see the so called 'arrow of time' as continuous change. We see, hear and feel changes and the temptation to interpret a 'duration' of change as 'time' is pretty strong. But this goes back a long way and it is not a coincidence that we still use the ancient sexagesimal system for our units today. So we've had a lot of practice, Ha! Equipment used to verify experimental results changes from day to day (parts wear) so it is important to ensure a standard state (ensuring material symmetry?). But your quote above is indeed the crux isn't it! in my simple interpretation of that crux I would ask 'what drives that continuous change? Is the answer at a 'sub-quantum' Level? Would that be a more fundamental 'time'? Enough of my ramblings, eh? Ha! Looks like it's exactly the same according to SRT, @SRU. If you're just going to deny all of science, we'll merely label you a stupid and move on. What does "what is time made of?" mean? Its a completely gibberish nonsense question, like "what is a series of events made of?" or "what is beauty made of? or "what is the mathematical constant Pi made of?" etc. Not everything that exists can be said to be "made of" something. Space and time are examples of such things. The Moscow scientists performed some modeling of the quantum computing. The claims and conclusions are exaggerated as to become ridiculous. This is all there is to say. "..."Time is 'separated' from space in a sense that time is not a fourth dimension of space. ..."
Entropy requires a definition of the arrow of time. So if you reverse entropy you have reversed time. Time doesn't exist in a meaningful way without entropy change - what would you measure it by in a totally static universe? Even in a universe that only consists of quantum fluctuations you could not say whether you're looking at 'forward time' or 'reverse time'. But what is the difference in meaning between "time is a fourth dimension of space" and "time is NOT a fourth dimension of space"? The meaning is: If they are independent then you can move in one direction but not in the others. If they are dependent then you cannot do so. Since you cannot move in a spatial direction without using any time (because of the speed-of-light-limit) space and time aren't independent. I'm pretty sure most of them know their way around a billard table. The meaning is: If they are independent then you can move in one direction but not in the others. That's obviously NOT what they meant. See the actual context it was stated. As described, this process doesn't seem to amount to time travel, but only a simulation of what would happen if time went backwards. Time itself still moves forward as the entropy of the system decreases. Even the billiard analogy attests to this: If I manage to kick the table in precisely the correct way to make the balls rack themselves back into a triangle, the seconds on my wristwatch are still ticking forward independently. So what am I missing? "According to the conventional view, clocks run slower at high speeds due to the nature of Minkowski spacetime itself as a result of both time dilation and length contraction. But Sorli and Fiscaletti argue that the slow clocks can better be described by the relative velocity between the two reference frames, which the clocks measure, not which the clocks are a part of. In this view, space and time are two separate entities." Agreed that Space is separate. However, I go further and say that "time" does not exist, whether popularly as a 'dimension' in Spacetime, or as separate but equal with Space. Space exists; we see its effects, but 'time' shows no physical effects as it is merely a concept that is referred to as 'time'. Grabbing at straws, are you? What has the concept of "time" have to do with all the rest of your gibberish nonsense about beauty and the mathematical constant of Pi? Space IS made of 'something', otherwise it would not even be considered as part of anything. Time, otoh, isn't made of anything as it is merely a CONCEPT PRODUCED BY THE HUMAN MIND. It is not a dimension, as it is nothing of a physical nature like Space is. As the Earth and the Sun is. As the atmosphere is. Even Magnetic Fields are a tangible feature of a physical nature. For some reason, you can't seem to understand these truths. Are you deliberately thick? Predicting the future is exactly science. That's how a hypothesis becomes a theory: predicting future events, in detail. So is fortune telling by gypsies. Predicting isn't science. Results are. Predicting isn't science. Results are. So you are claiming that predicting the results isn't science? Did you forget the part about *predicting the results*? Consider: ONE of the AIMS of science/scientific method is to be able to predict outcomes in similar and extrapolated physical situations. A PREDICTION MAY turn out to be WRONG; hence 'prediction' per se is NOT 'science', merely an 'aim of science'; which aim is achieved when the prediction can be shown to be consistently correct in all cases. So, instead of just answering a perfectly simple question, you just repeat your same old assertions without premise. What is stated without premise can be dismissed without premise. You are clearly talking nonsense. "what is time made off?" is just pure gibberish. No, because that's a gibberish assertion. What does it mean? That assertion makes no sense. If that makes sense then 'time' didn't exist before the earth existed; (your logic). No, points in space are by definition point in space, not by definition point in time. Using your logic here, if the earth does a full orbit and ends up at the same point in space as before then the point time it last was at that point in space is now the SAME point in time as the point in space in is in now (because the two points of space it was at, before and after, are the same points in space) and thus either the earth never did a full orbit because there was no before and after and/or it did a full orbit infinitely fast i.e. within a zero time interval because those two points in time would be the SAME point in time. This would be utter nonsense. "time" spelled backwards is "emit"
Argue all you want. Time is STILL ONLY a CONCEPT and not a real "thing". Checking your watch for the time is checking on the Passage of the Duration of an Event/Action by its verifiable increments on the watch face. If you still fail to understand that easy statement - you may need to see WHY you are having trouble with comprehension. LOL Now tell us what "time" has the ability to "emit", and where has the "time" gone. When you say, "it is time for a checkup" - it is the "checkup" that is the Event/Action that evokes the Concept, as your Mind/Brain CONCEIVES of that necessary checkup and its coming Passage and importance. The coming of that Passage is what your Mind/Brain has told you to prepare for.